Download this image (PNG, 1.0 MB). [13-May-11] An image of Chlorophyll distributions captured by the Geostationary Ocean Color Imager (GOCI) in May of 2011. Greens and yellows indicate higher chlorophyll concentrations. Land areas are shown in brown and clouds are depicted as gray. 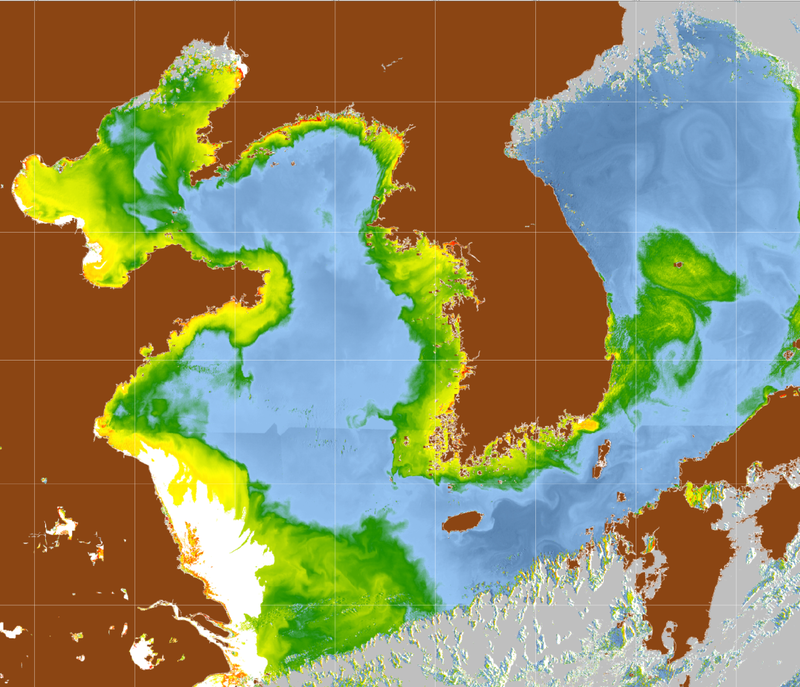 For the Korea - United States Ocean Color (KORUS-OC) campaign, scientists are seeking to better understand how oxygen and carbon flow between the ocean and atmosphere; the role that phytoplankton play in these processes; and what affects air quality in the region. They are investigating how different species of phytoplankton absorb different wavelengths of light and how blooms evolve at different times of day. These data will help NASA optimize instrument capabilities as they develop sensors for future ocean color missions, such as the Geostationary Coastal and Air Pollution Events (GEO-CAPE) satellite.